Few landmarks say Cincinnati like The Roebling Suspension Bridge. 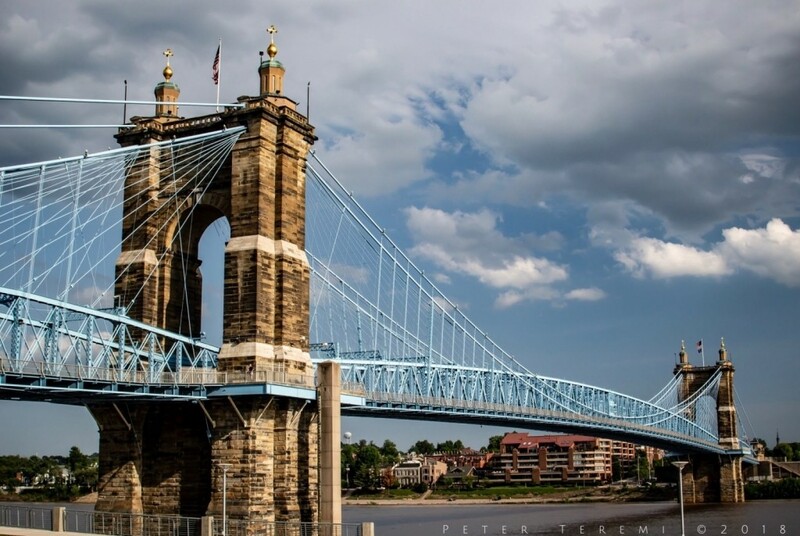 This iconic structure, dedicated 1867, rises majestically above the Cincinnati and Covington skylines. Often called the singing bridge because of the sound that vehicles make as they traverse the steel grated platform, I may add an alternative theory. While out walking Murphy on gusty days, I have heard wind whistling through the bridge producing the sound of focused breath over a many glass bottles. Both haunting and wistful, it left me with a feeling this bridge was part of some cosmic symphony. It is interesting to think of a bridge in the woodwind family, but there it is. This sound still makes Murphy uncomfortable, but he’s better than he used to be. Hoping you find your own universe music as we spin through the cosmos on our little blue home. Happy Murphy-Cam! How cool Allan. Tickle foot is the truth. Thanks for sharing, and the kind words!